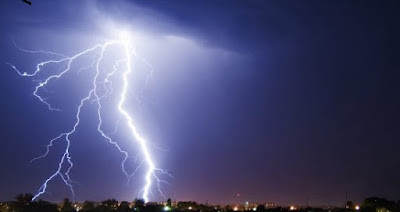 A 47-year-old civil servant, Salami Adekunle, was on Thursday struck to death by lightening in Oro, Kwara State, the News Agency of Nigeria reports. NAN gathered that the deceased was a staff of the Registry Department of the College of Education, Oro, Irepodun Local Government Area of the state. He was said to be leaving the institution’s examination office for the Registry Department at about 10 a.m. when the incident happened during a downpour. The lifeless body of the deceased, who hailed from Ilesa in Osun, was sighted lying at the spot of the incident preparatory to spiritual cleansing. Adesola Adewoye, the institution’s spokesperson, who confirmed the incident, said that all efforts to revive the deceased proved abortive. “The staff and management swung into action immediately the deceased was struck, but all our efforts to resuscitate him proved abortive,’’ he said. He described the deceased as an easy going, loyal and dedicated staff who stopped at nothing to impress his employer. “Our prayer is for God to give the family, friends and associate the fortitude to bear the irreparable loss,” he said. A NAN correspondent, who visited the scene of the incident, reported that staff of the institution were seen in groups discussing the development. Some traditional religion worshippers were said to have later performed some rites on the corpse before it was taken away for burial.